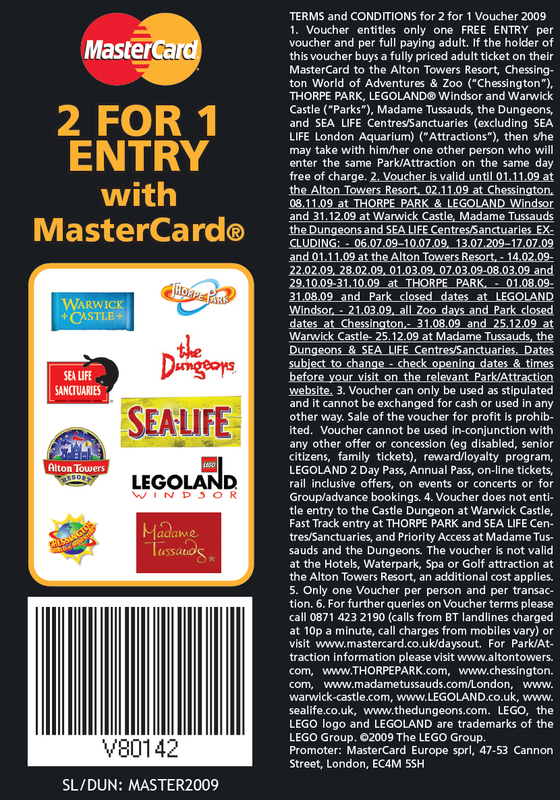 Voucher entitles only one free entry per voucher and per full paying adult ticket on their Mastercard to the Alton Towers Resort, Chessington World of Adventures & Zoo, Thorpe Park, Legoland Windsor and Warwick Castle, Madame Tussauds, the Dungeons, and Sea Life Centres/Sanctuaries. This entry was posted on Sunday, June 21st, 2009 at 9:03 am	and is filed under Magazine Based Vouchers, Mastercard Offers. You can follow any responses to this entry through the RSS 2.0 feed. You can leave a response, or trackback from your own site.